I was in the upstairs room at home (air conditioned!!) reading through a training manual for a job. I have an alright view to the west through the side window, so I kept my eye on proceedings, and also had radar loaded in front of me. I kept running outside every 5-10mins to grab a photo of the developing cell. 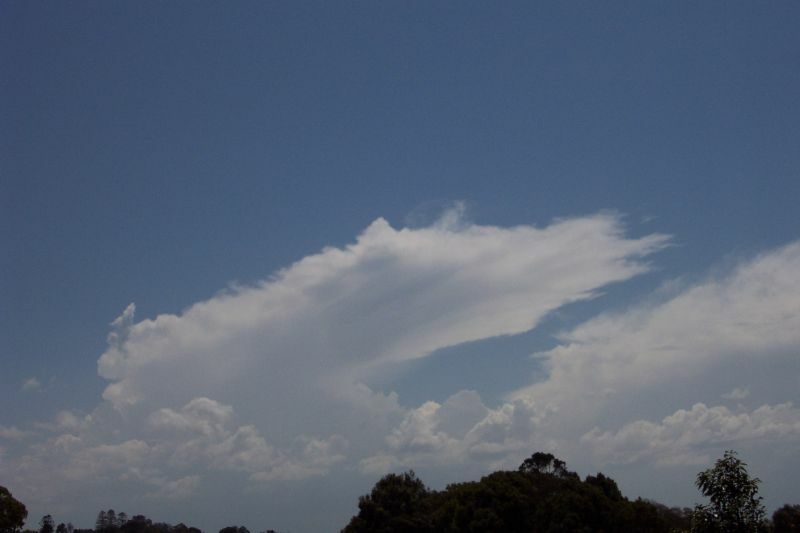 It was quite obvious how strong the upper winds were, as the anvils were rapidly being dragged away to the NE. 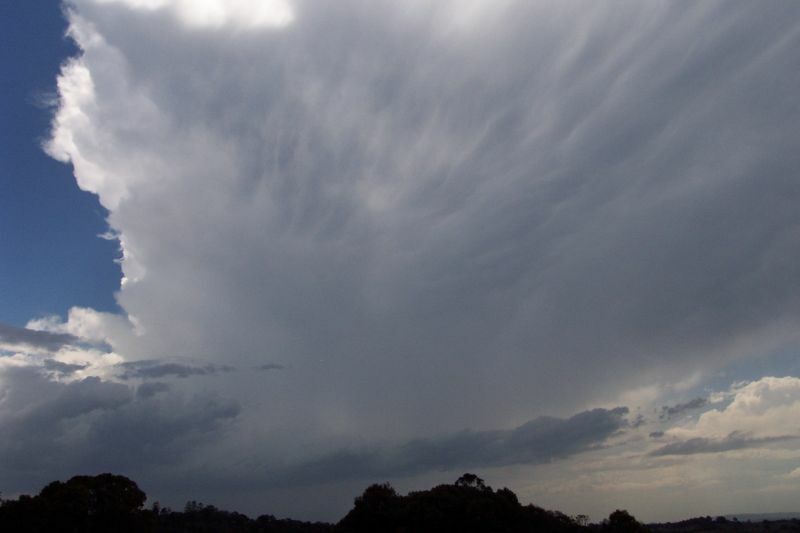 The cell looked fairly weak in it's initial developing stage, but it soon had a very thick, well defined anvil spreading overhead, with developing mammatus around 2.40pm. 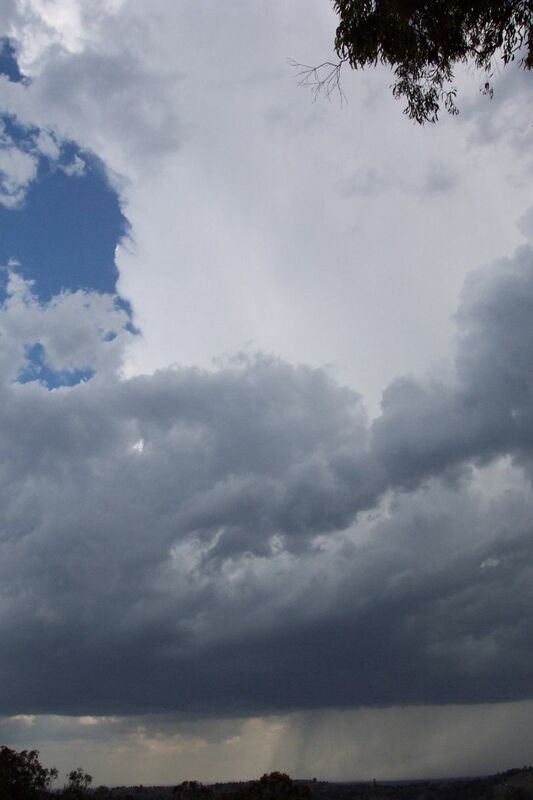 Fresh updrafts were also visible on it's southern flank. Radar was showing the cell near Casino, with a large area of green and tiny pink core. After a bit of pushing by Michael Bath, I decided to head out for a look. 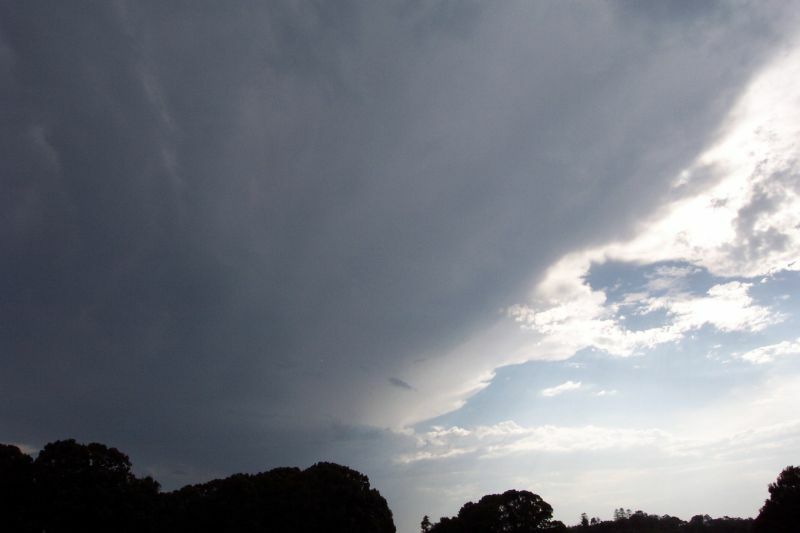 The cell now looked quite large visually, with a massive anvil overhead. It really only had a very small precipitation area, and looked fairly high based. Still it looked like it was worth heading out for (especially since it looked to be heading in a more easterly direction than the other cell). I grabbed the camera and video camera, took a couple of pics before I jumped in the car, and then I was off. What was a little scary was that I had no mobile phone with me, and had never chased alone before. This was the time where Stormboy had to become Stormman!! When driving down towards Lismore, I was wondering if I should head for a lookout in Lismore, as I thought it still may head north of east. I ended up sticking to the original plan and heading for Tregeagle, thinking I could get a quick view of the cell, and then easily heads towards Lismore if it was heading that way. 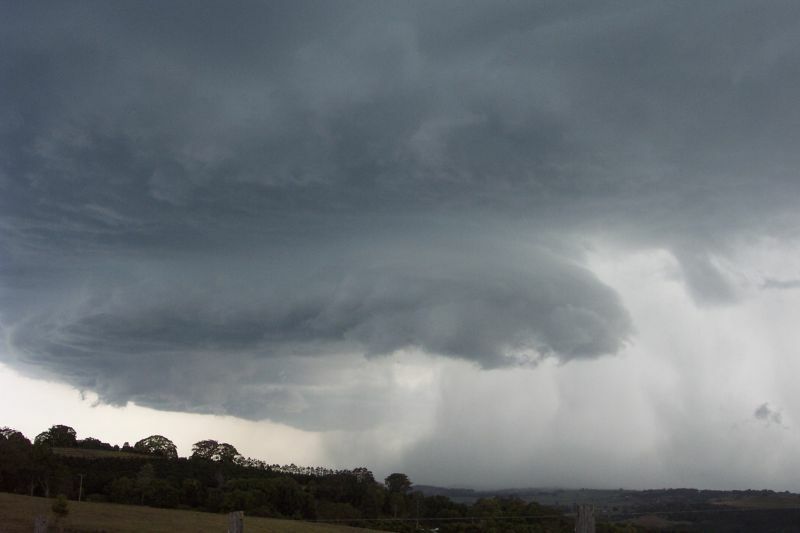 When I got to the Tregeagle lookout around 3pm, I realised I had made the right decision, as I had a perfect view of the cell to the west of me. I was quite surprised however that there was so little precipitation considering what was on radar. I was concerned it may be weakening out, and that I'd missed the show. 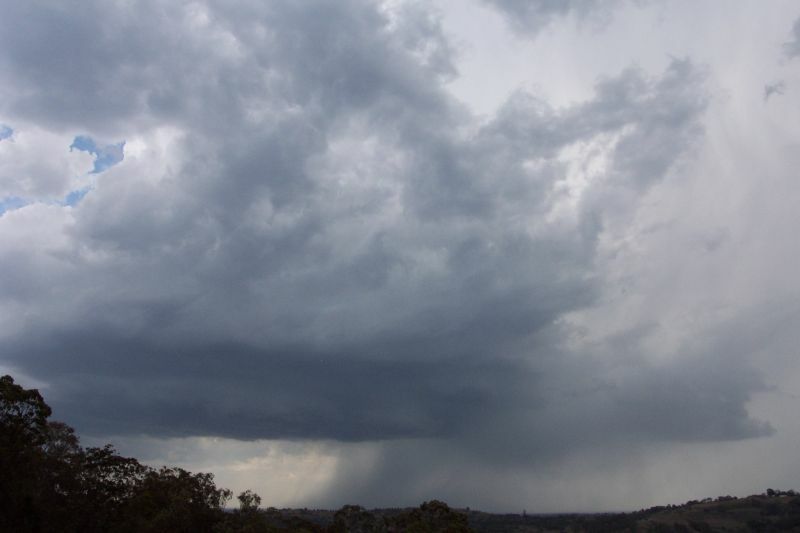 I continued to watch the cell, and by about 3.10pm it was giving a bit of a better rainfoot underneath, and the previously rain free area now had precipitation coming out of it. 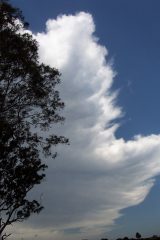 Looking overhead, the anvil was beginning to develop and spread a little further on its eastern side than it had before. 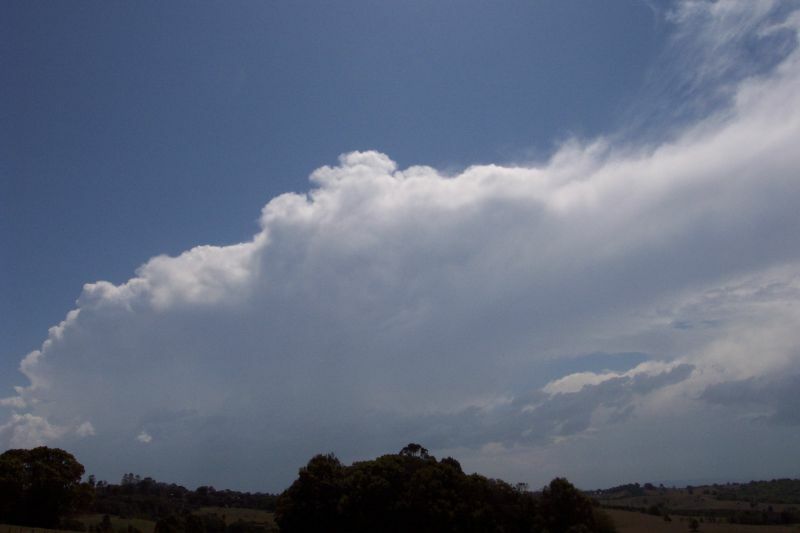 The front of its anvil was now far away to the NE. 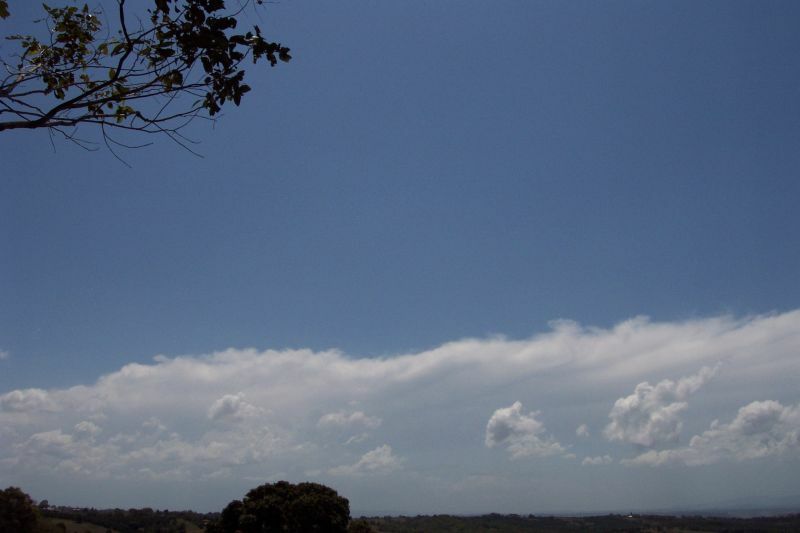 A weak anvil from a storm somewhere to the SW was also streaming in overhead. I hadn't seen any CG's, but what I originally thought was an aeroplane for the last few minutes, was in fact fairly constant thunder, but not really distinctive. 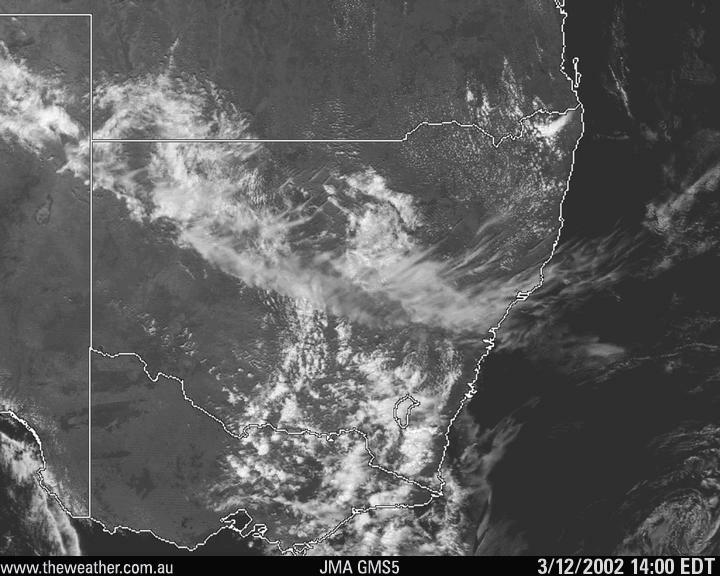 The rainfoot continued to develop, now looking quite alright. Strong, very moist NE winds were feeding into the cell now, and explosive updrafts could be seen on its southern flank. 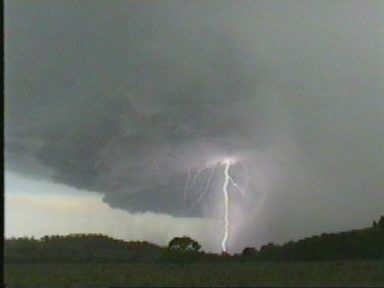 After this I noticed what appeared to be a lowered area of the RFB (rain free base) and watched this quite closely. Within the next few minutes, this became much more defined, and developed into a high based, but well defined gust front. Things were now beginning to really take off! 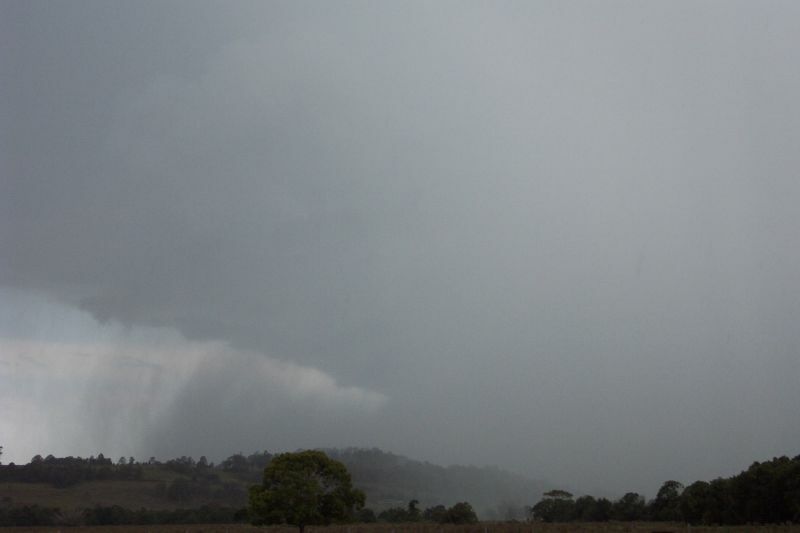 The rainshaft was now very heavy, with a slight green tinge evident in the top of the shaft. 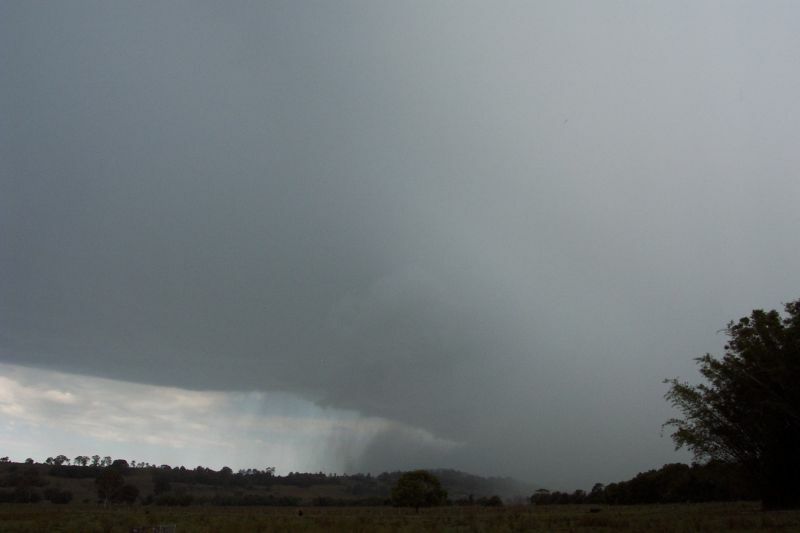 The rain was spreading out as it hit the ground, suggesting a microburst, and then being sucked back up into the updraft nearby. It was very turbulent, and quite incredible to watch. 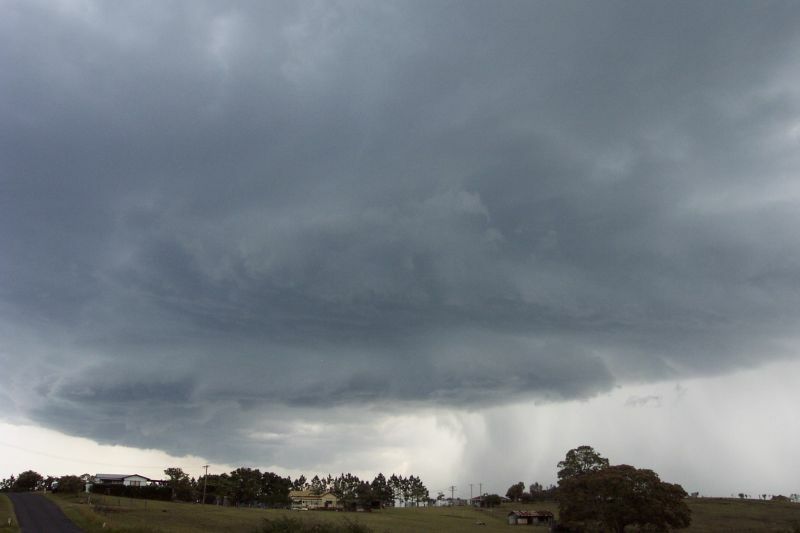 It was at this point I realised this cell would now have to be severe, with respect to strong winds. CG's were now visible, and thunder was now that distinctive 'boom' sound! 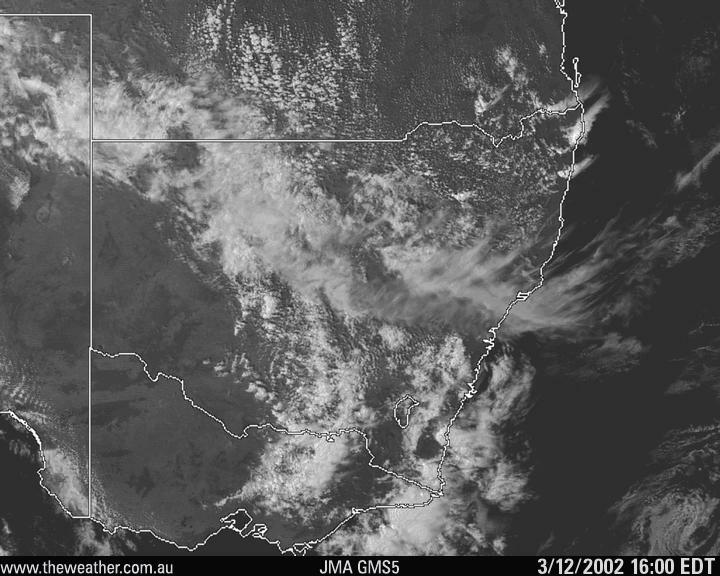 By 3.14pm I realised it was time to push on, as the cell was now heading ESE (lucky I didn't go to Lismore earlier! ), and the anvil had rapidly grown eastward, right over the top of me! Updrafts behind the cell were going off like a bomb! I am not really familiar with the road system near the Tregeagle/Tucki area. I decided to drive down a road that looked to head south, going to Tucki. I was really unsure where it would take me in the end, but for the first part of it, it seemed to be heading just where I wanted. The guster and rain beneath it looked truly impressive. 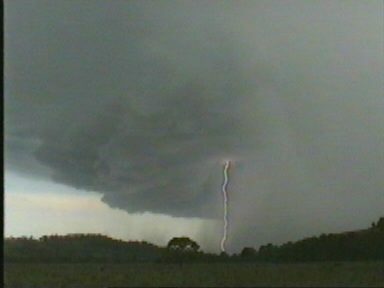 CG's were now becoming more frequent, but the rainshaft kept lighting up white with incloud lightning, along with continuous, really deep thunder. After passing the local school I came to a nice clearing to the SW around 3.22pm, and couldn't resist stopping for photos and video briefly. This storm had really taken off and had beautiful structure. I couldn't believe how constantly loud the thunder was. It was that perfect summer afternoon thunder that chasers love! After a quick shot I went a few km's further down the road and stopped at an even better clearing at 3.25pm. The guster was so well defined, not 'scuddy' and looked really crisp. 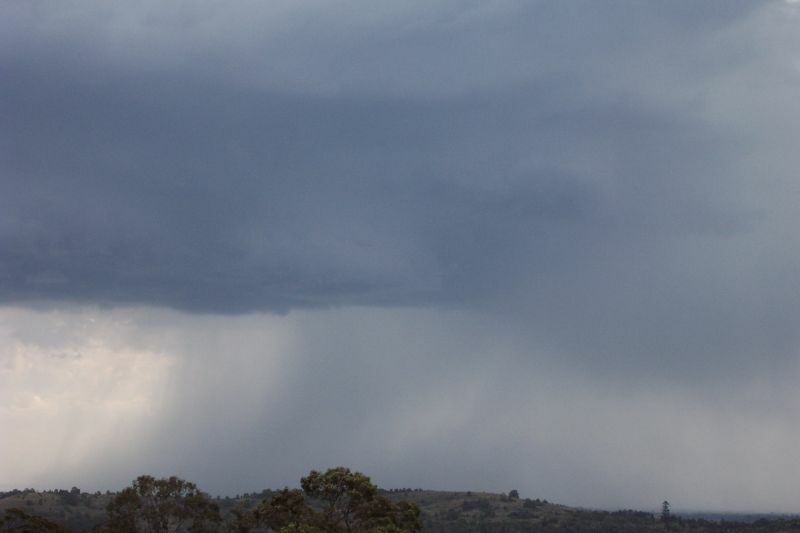 The rainshaft didn't look quite as heavy now, but still looked to be producing some fairly strong microburst winds. As I continued down the road in the hope to catch the cell, fear set in as the road became treed in, and heading in a more westerly direction. I was also now on the western side of a hill, and so could no longer see the cell. When I got to the bottom of the hill there was a clearing, and I could once again see the cell. The front was now south of me, and I got a side-on look at the guster, which was pretty cool. It was 3.28pm. After taking photos/video I noticed a road heading south just ahead. 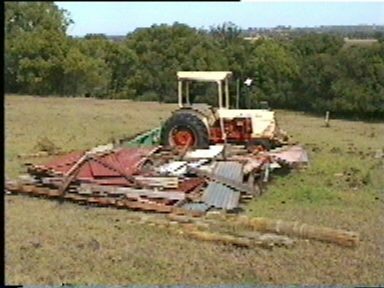 I tuned down it, but realised it went into someone's property. 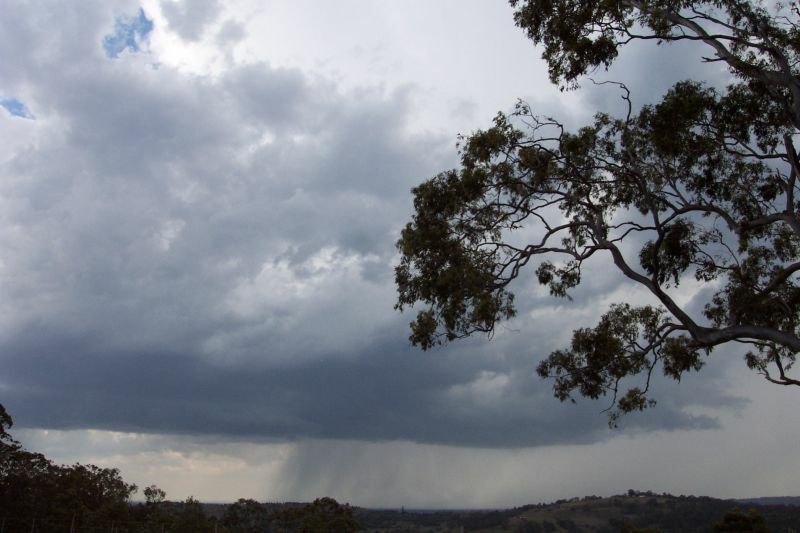 Rain was now beginning to fall on the car, so I headed back a bit to the vantage point I was just at and took a few last photos as the cells core passed about 1km south of me at 3.30pm. 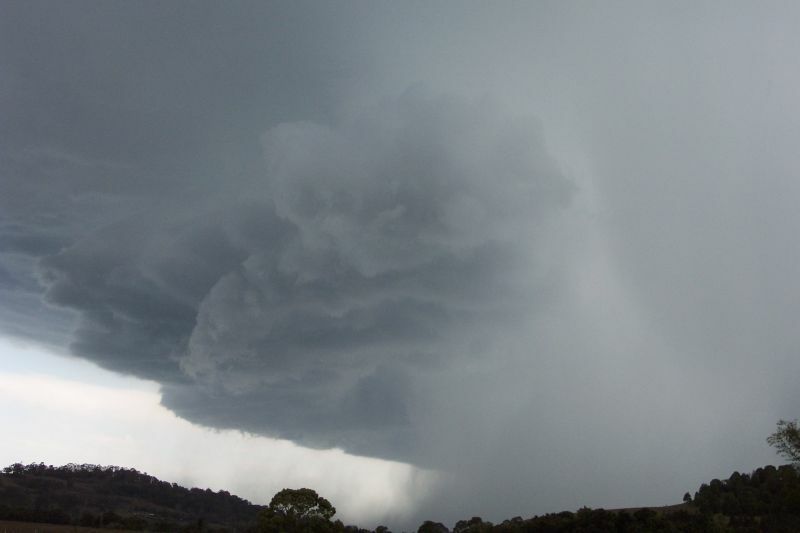 The speed at which the rain was being thrown out of the main core to the east was quite scary. That cell most definitely had severe winds now! 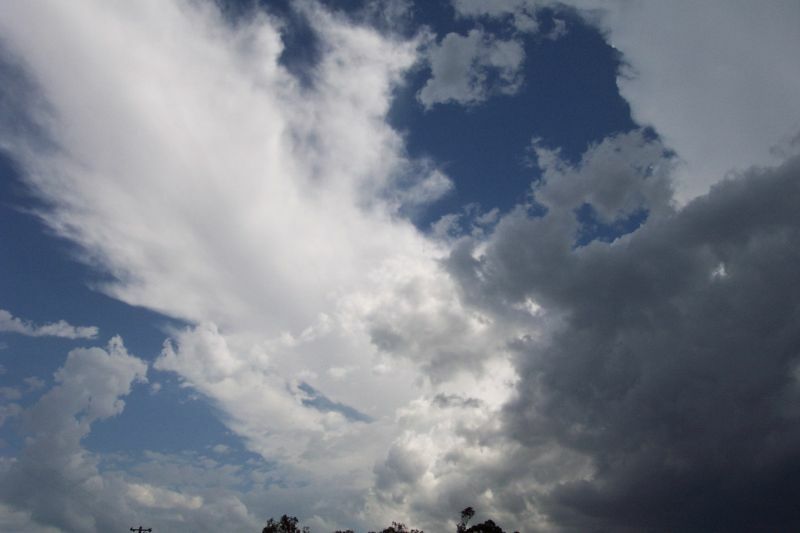 Heavy rain fell where I was (seemed to be from the anvil) with very little wind. I was quite shocked, as I was expecting the car to be thrown around by the winds, but nothing happened. I drove back on the road I came from, with heavy rain all the way back to the Bruxuner Highway. Petrol was almost out to. As I came to my street I wondered if I should keep heading south and chase the storm all the way to the coast, as it still looked to have pretty intense rainfall. I ended up coming home (petrol was a bit of a factor). It was nice to listen to the deep thunder coming out the back of the cell from home. 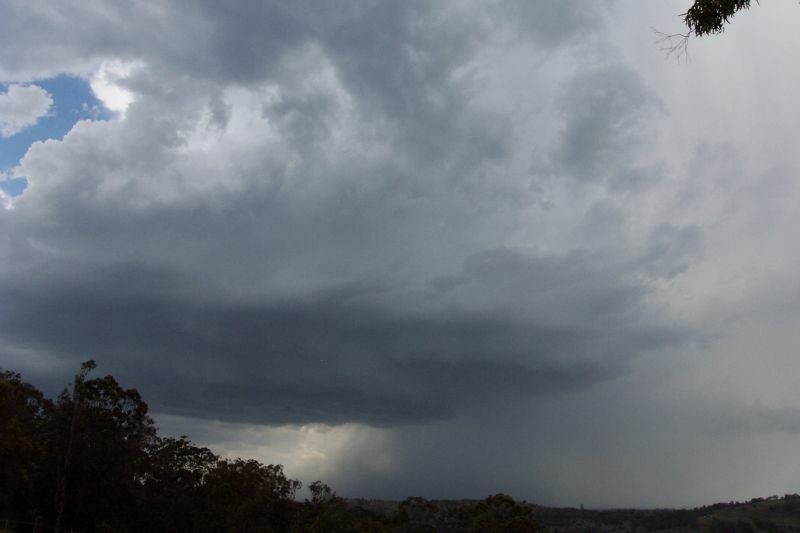 Radar showed a large pink core at 3.30pm, and the cell seemed to collapse around this time. What I hadn't realised yet, was that radar was not seeing everything for some reason, and some storms weren't even showing up on radar. Around 5pm I noticed another nice thick anvil spread overhead but going by radar (a bad idea at this stage), appeared to be a long way away. I had to head back into Lismore but took this photo before going. 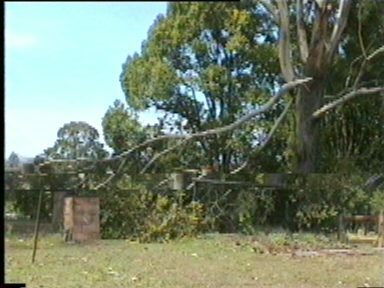 When getting home Michael informed me that radar had underestimated the cells today, and that severe damage had been reported in the Wyrallah and Tuckurimba areas. We decided to go out for a look before it was all cleaned up. 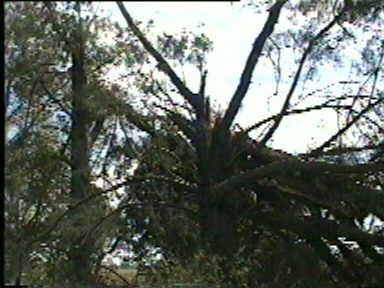 It was getting late when we got there, so light was a bit of an issue, but we saw plenty of trees down, with some trees completely twisted off well above the ground!! 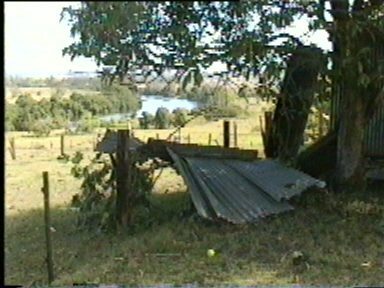 An old farm shed had lost it's tin roof, and it had been thrown across the road. My dad called to let us know that a house had had it's shed destroyed, and large trees were down there so we had a look. 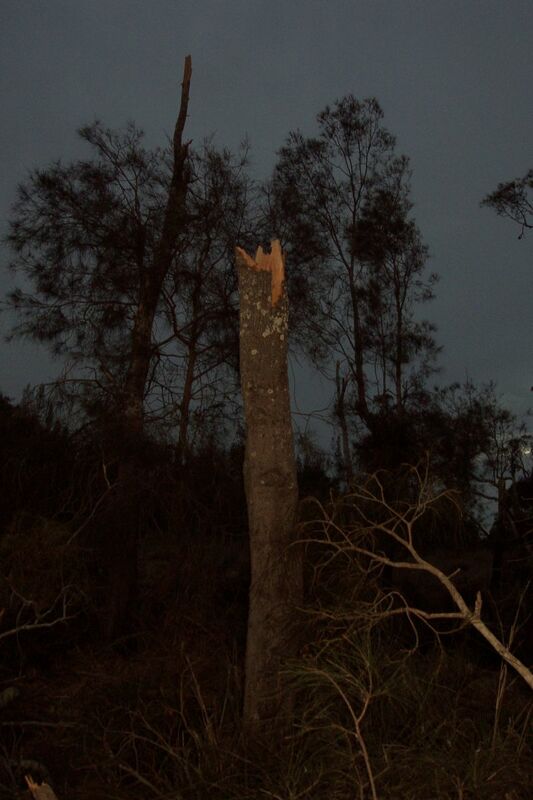 We found plenty of large trees knocked down, and some snapped off completely. 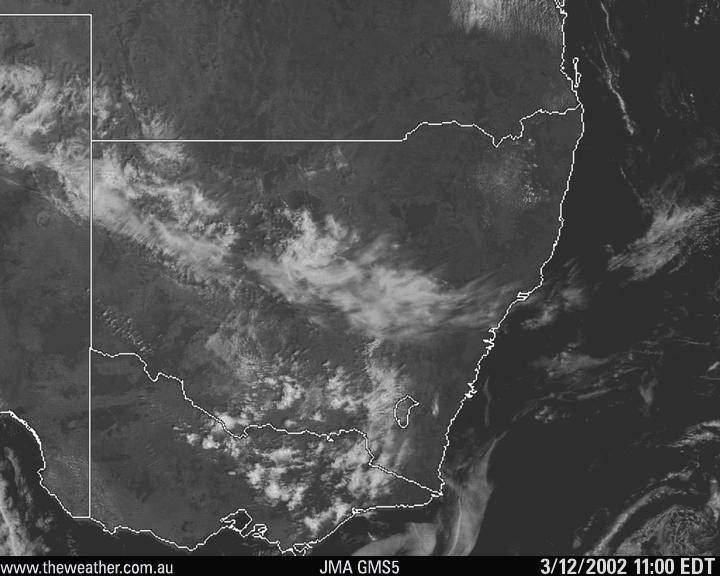 Cells could now be seen all along the horizon, with a large looking cell SW of us. We had no idea if it was severe or not, and if it was heading for us. Around 10pm I got home after going out again and there was lightning in almost every direction. 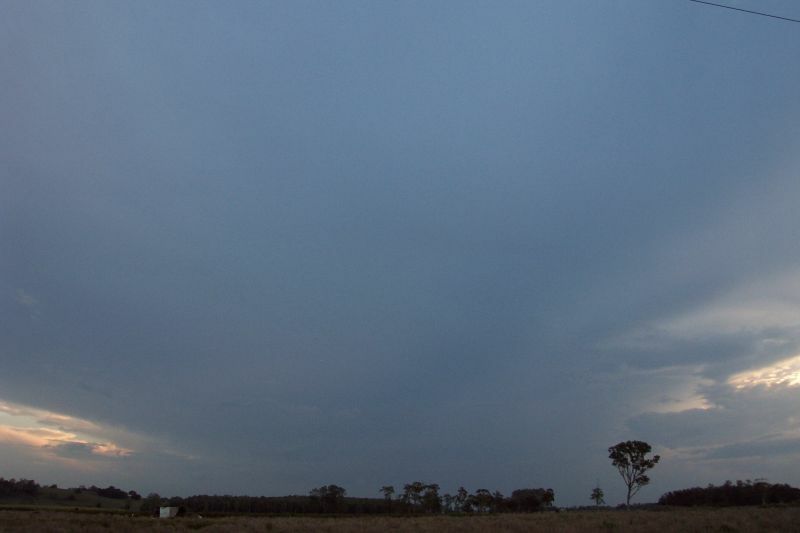 A cell near Tenterfield was giving some nice lightning, but soon died before reaching here. 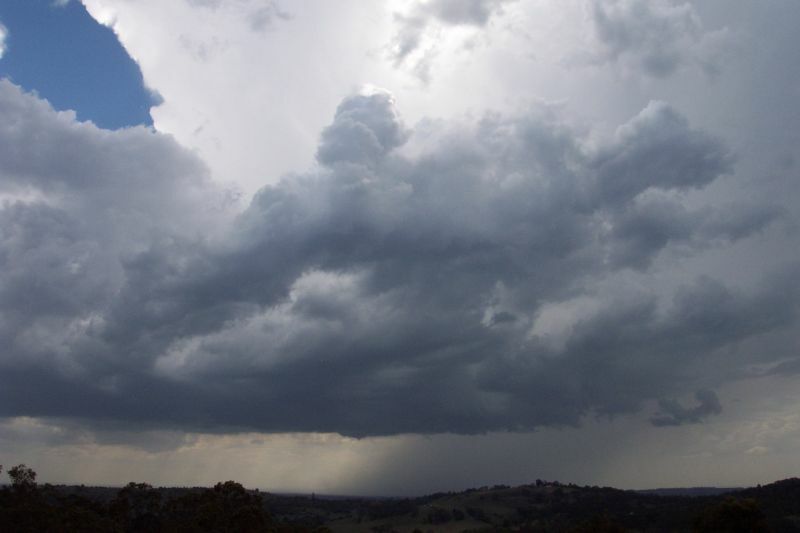 A stronger cell near Byron Bay was giving fairly frequent and very bright flashes. Only in cloud lightning was observed, but it was bright enough to keep me awake when trying to get to sleep! In the morning, dad had to go repair some electrical gear that had been damaged and took some footage. 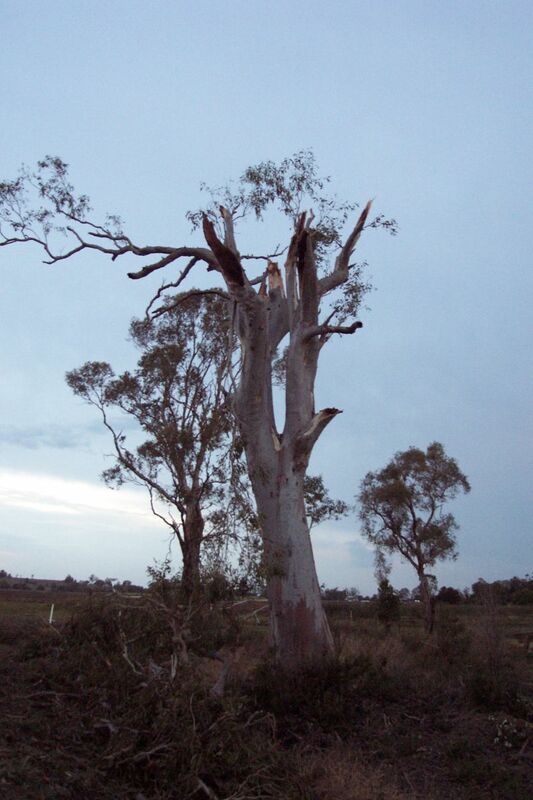 These stills show some of the damage. Apparently a house in Wyrallah had it's roof ripped off, and there was an unconfirmed report of 150km/hr winds!! 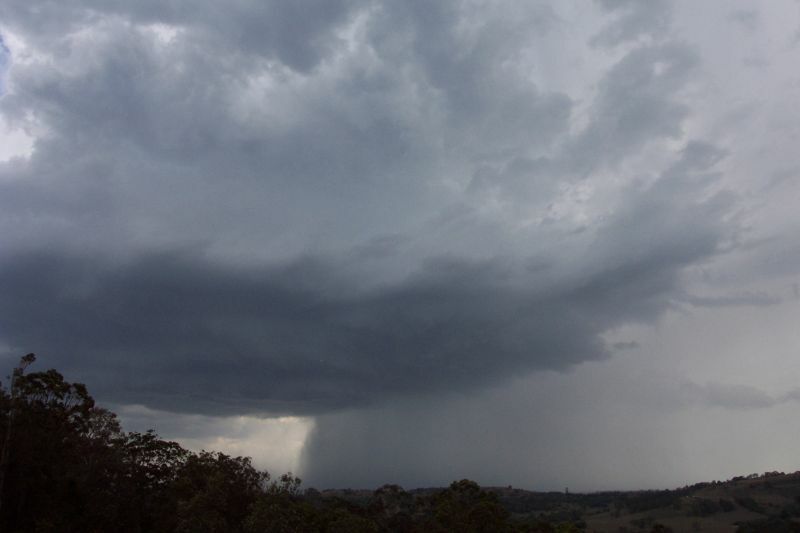 It turns out I was very lucky that I couldn't get close to the storm, as I may have had a tree come through the roof! 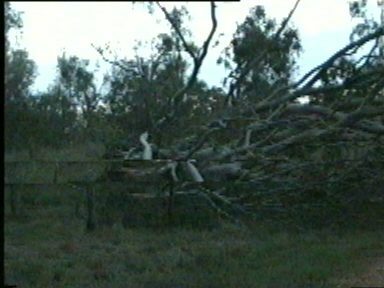 What was interesting was that I was about 1km north of where the damage occurred, and I only received very light winds! 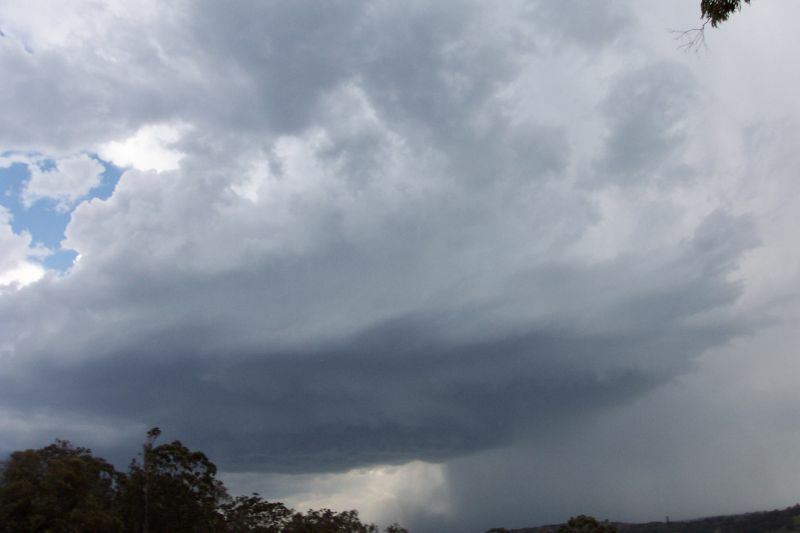 Certainly a memorable chase, with the storm producing some great structure. If you (or someone you know) have any photographs or video of this event, please feel free to contact Dave Ellem. Your contributions are very welcome.